Whether your metal roofing project is a re-roofing project or a new construction, Marco Metals, LLC offers everything needed to complete your agricultural, commercial, recreational, or residential building project. Marco Metals, LLC is a manufacturer of quality rolled-form metal roofing panels and accessories for metal roofing projects (such as vertical metal panel siding and post-frame building products). We offer our metal roofing products to the general public, contractors, and other distributors. Our premium quality metal roofing panels and accessories are backed by extensive warranties. At Marco Metals, LLC, we are committed to providing our customers with the highest quality metal roofing products, accessories, and service in the industry at competitive prices. At Marco Metals, LLC, we provide information and resources about why metal roofing is an enduring choice for professional architects and builders; and how we select our materials and manufacture our products. We use the highest grade WeatherX® silicone polyester coil coatings from Valspar specifically engineered for metal building components and systems. 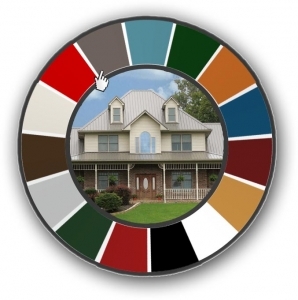 Use our new color picking tool to see what roofing colors look like on one of our model homes. Galvalume® sheet metal with a full 29 gauge thickness is the heart of metal roofing panels from Marco Metals, LLC. Our mission is to offer quality metal roofing and post-frame products at competitive prices, while demonstrating the Biblical standard of graciously serving our fellowman.